Green D.C.: Segway Lives in D.C.! It appears rumors of the death of the Segway Personal Transporter electric vehicle are premature. While the rest of the country mocks the awkward, bulky design and ridicules its use as a commuting option with a top speed of 12 mph, the Nation's Capital has been oblivious to this perception. Every day Capital Segway City Tours and other tour companies zip visitors around D.C. to see the monuments and museums. You can't miss the big groups riding around town with fanny packs, cameras and FBI t-shirts in tow. And the Metropolitan Police Department is even using Segway scooters for community policing. While two D.C. cops riding the streets in an electric scooter might look like a scene out of "Robocop," it is apparently an effective method of policing that is used all over the world because it is quicker than on foot and increases the field of vision. 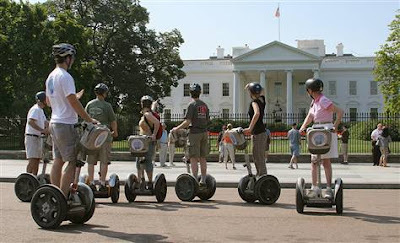 So say what you want about the Segway, but the machine has outlasted the late-night punchlines and is here to stay -- at least in Washington, D.C.